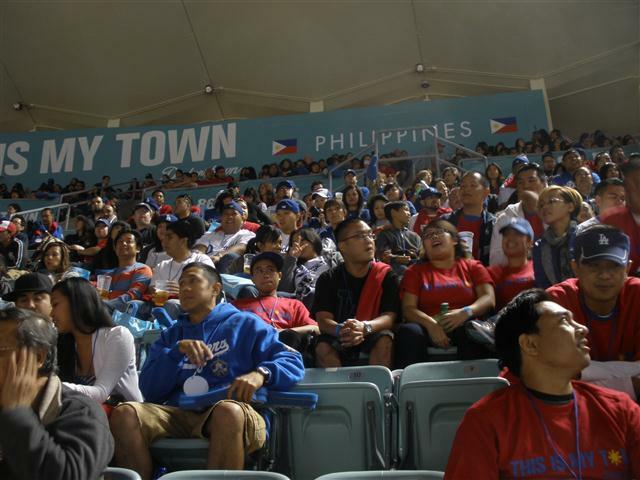 Tonight, I not only took in a Dodger game, but partook in some ethnic pride in attending the second “My Town: Philippines” night at Dodger Stadium, where the Boys in Blue played the third and final series game against the St. Louis Cardinals. Nearly a thousand people filled the “My Town” section in the far right field corner of the Reserve level, considered one of the worst seats in the entire Stadium. But the Dodgers’ marketing department decided to add value to the least desirable vantage point by offering all-you-can-eat food and beverages, and freebies. Remember, we were playing the Cardinals, whose team color is red. So for the uninitiated, the “My Town” section probably looked like a flock of Cards fans. Being the diehard Dodger fan that I am, I flat out refused to put the shirt on, even when we were told to when the stadium cameras put us on the DodgerVision screen. Really now! The other faux pas issued by others there was the so-called chicken adobo, which was a little more like teriyaki. I propose that in the 2011 “My Town: Philippines” night, they serve up Filipino-style sweet spaghetti, with Dodger Dogs! That would rock on so many levels. Though I can’t complain that much. 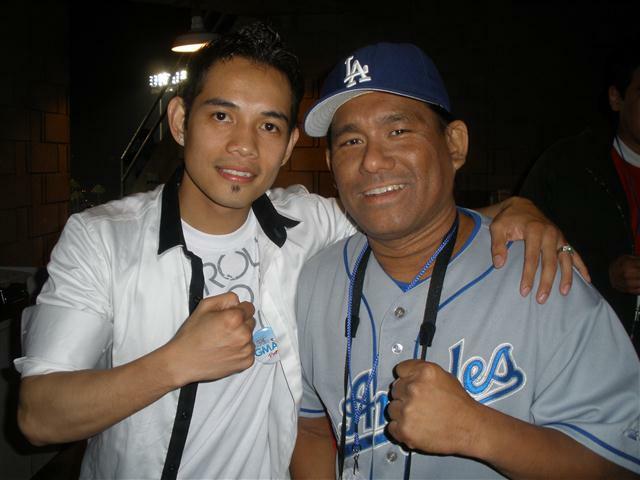 I did enjoy the game with several friends, as we were among a group of some 200 arranged by the Filipino American Network – Los Angeles, and I got to meet Filipino American boxer Nonito Donaire, who incidentally was born in the same island my mom is from. With Pinoy boxer Nonito Donaire. Boholanos represent! But best of all, thanks mostly in part to a 2-run homer in the first inning courtesy of Manny Ramirez (see, this was a crowd that’s used to being “Manny” fans…), the Dodgers not only won the game 4-3, but swept the Cards! Aside from the Filipino Dodger Dog spaghetti thing, my other biggest with for a future “My Town: Philippines” night is to see Fil-Am Dodger prospect, outfielder Angelo Songco make the big leagues and make us truly proud to see a Pinoy in Dodger Blue.